A popular Carribean food item dating back to the early 1900's that was basically made as a hot meat sandwich with cheese. 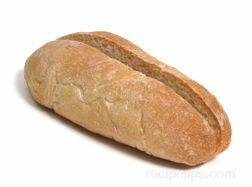 Today there are many different versions of this sandwich that vary with ingredients and the type of bread used to make the sandwich. 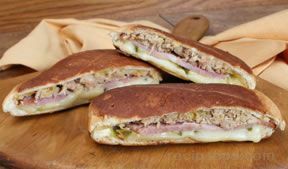 However, the traditional Cuban Sandwich is made with a Cuban bread that is cut in half lengthwise for each side of the sandwich. 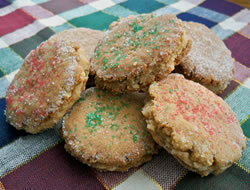 It contains a somewhat crusty outer texture while the inside crumb is soft. 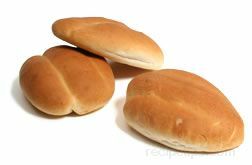 Made basically the same as French bread, Cuban bread may consist of individual small oval-shaped bun-like loaves or longer and harder crusted short sandwich loaves. 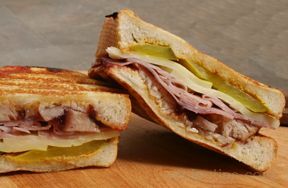 The ingredients that go into the sandwich include a slices of cured ham, roasted pork, Swiss cheese, and sliced pickles. Typically, a sweeter variety of ham known as bolo ham is traditionally used. 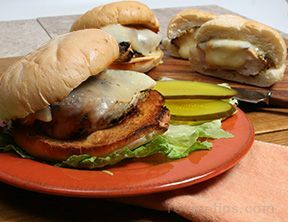 Roasted pork that has been shredded is placed over the ham, thin slices of pickles go over the meat and a piece of Swiss cheese is added between the ingredients. Prior to serving, the sandwich is placed in a Cuban grill, referred to as a "plancha" or in a hot griddle, a cast iron pan, or a grill pan without ridges. The entire sandwich is pressed down by the top of the sandwich press or by using a heavy metal meat press so the end result comes out looking like a compressed sandwich. It is grilled for only a few minutes to allow the cheese to melt, to warm the ingredients, and to toast the outside of the bread so it becomes golden brown in color. When served this sandwich is warm, moist and very flavorful. Although dressings are not commonly spread on the bread before serving, a dipping sauce such as mustard may accompany the sandwich to provide additional flavoring for this food item.